Three stallions, known as the Foundations Sires, are at the beginning of all the blood lines of the Thoroughbred horses registered in the General Stud Book of Thoroughbreds maintained by Wetherby’s and first published in 1791 or any of the other approved foreign stud books. The name of the stallion shows its origin and its original owner – all three foundation sires were imported from the Middle East to improve the breeding stock in Britain. In particular, they were imported because their own blood lines had demonstrated their prepotency, that is, their capacity to pass on more than his or her own share of characteristics to their offspring. In the case of the Thoroughbred, it was the prepotent stamina of the Middle Eastern horses to run over the traditional length of four miles against another horse. These three were not the only stallions to have been imported from the Middle East – there were upward of 200, but the bloodlines of the many others have died out. Some have left their trace, however. 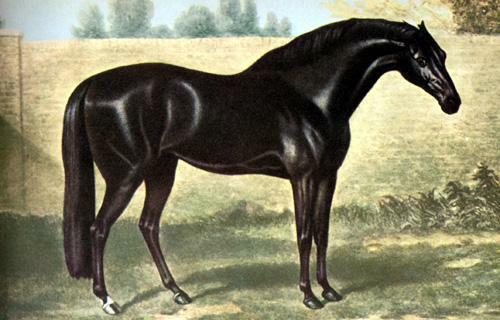 The dominant grey coat colour gene was introduced into the Thoroughbred population by Allcock’s Arabian in the early 1700s. All grey thoroughbreds (about 3% of the total thoroughbred population) carry the DNA of Allcock’s Arabian. Prepotency will only become evident after several generations and may run down the male or the female line. Whilst it is not uncommon for an exceptional horse to be the result of an unexceptional mating, it is nowhere near as likely that the offspring will transfer those positive attributes down the bloodline. Only where the attributes are reliably transferred can there be said to be prepotency. The first of the prepotent foundations sires, the Byerley Turk, was foaled in about 1680. He was allegedly captured by and used by Captain Byerley as a warhorse. His influence has declined and now the huge majority – more than 80% – of Thoroughbreds trace their line to the Darley Arabian through one of his descendants, the superlative Eclipse. The Darley Arabian was foaled in about 1700 and bought by Thomas Darley in Syria in 1704. 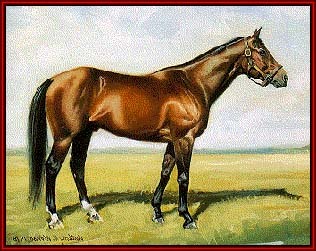 The stallion’s great-great-grandson, Eclipse was foaled in 1764 and named after the great eclipse of the sun that year. Eclipse won eighteen races, though other owners became reluctant to put their horses up against him as he never appeared at all stretched. He was retired to stud in 1771. Twenty five after the Darley Arabian, the third stallion – the Godolphin Arabian – was foaled in Yemen, and imported via Syria to France in 1730. He was then brought to England by Edward Coke and bought by the Earl of Godolphin following Coke’s death. The Godolphin Arabian’s bloodline has been overshadowed more recently by that of the Darley Arabian but includes the famous Seabiscuit. Modern day races are shorter than four miles. The five classic races – the 1000 guineas, the 2000 guineas, the St Leger, the Oaks and the Derby – range from a mile (or eight furlongs) for the 1000 and 2000 Guineas over the Rowley Mile at Newmarket, a mile and a half (twelve furlongs) for the Derby and the Oaks at Epsom, to one and three quarter miles for the St Leger at Doncaster. The St Leger is the oldest of the classic races, having been first run in 1776. Nowadays the Thoroughbred is bigger – rarely less than 15.3hh – than the original stallions who were probably barely 15hh. They also mature earlier, and run over shorter distances, clocking up to 45mph. It is from the flat racing stock that the blood line descends since Thoroughbreds used for National Hunt races are all fillies or geldings. Prepotency can be increased by breeding programmes which feature inbreeding, close breeding or line breeding. These breeding programmes interfere with natural selection with the intention of allowing prepotent characteristics to prevail though homozygosity. The risk with all breeding programmes is that, because of increased homozygosity (more pairing of identical alleles), the offspring decline in vigour and fertility. Just as desirable characteristics are more likely to be transferred by controlled breeding programmes, so too are undesirable characteristics. This makes breeding programmes generally controversial, though line breeding holds fewer risks than inbreeding. Hybrid vigour occurs with outbreeding or cross breeding and is the phenomenon produced where the foal is superior to the sire or dam. Such vigour may not, however, be prepotent and pass itself on to future generations. Scientists have mapped the dominant grey coat colour gene and services to the lucrative thoroughbred breeding industry claim to be able through DNA analysis to predict prepotency without waiting for generations to evidence it. When horses are inbred haphazardly, without culling of inferior stock, many undesirable traits may become predominant in their offspring. For example, the inbred horse’s ability to resist disease and his overall performance capacity are often depressed. The growth rate of the inbred foal, and the average mature size within the inbred herd, frequently decreases. Nonselective inbreeding is directly related to a depressed fertility rate, an increase in abortion and stillbirth. Some basic principles of genetics show why these traits are directly related to inbreeding.When two unrelated horses are mated, the chances of unidentical alleles combining within the resulting embryo are high. On the other hand, mating close relatives increases the pairing of identical alleles (increases homozygosity). The effect of increased homozygosity is a decrease in the number of heterozygous gene pairs and, subsequently, a decline in heterosis (i.e., loss of vigor and fertility). Although the reason for this allelic interaction is not clear, geneticists believe that its presence contributes to the overall quality of an individual. Therefore, as homozygosity increases within the inbred herd, physical quality controlled by overdominant alleles declines.Many undesirable genes affecting the horse’s overall vigor and fertility are recessive. Fortunately, they have no influence in the heterozygous state, since the effect of the recessive allele is completely hidden by the effect of the corresponding dominant allele. Because of the overall effect of inbreeding is an increase in homozygosity, it increases the number of homozygous recessives. Hence, the effects of undesirable recessive genes begin to surface. Inbreeding does not create undesirable trait, it exposes recessive alleles for hidden weaknesses which are present within the sire and dam. Because successful inbreeding demands the culling of inferior breeding stock over many generations (to help eliminate some of the undesirable recessive genes from the herd), it may not be feasible for some breeders. Not only is the time factor impractical for most breeders, the intense culling often necessary may be an economic problem. Additionally, the traits which tend to surface within the inbred herd (such as depressed growth rate and decreased size) contrast sharply with what many breeders select for. Therefore, the breeder must be objective when the need to cull arises.Perhaps the greatest advantage of inbreeding is that it increases the prepotency of individuals within a herd and consequently helps to create distinct true-breeding strains or families. This prepotency (the ability of a stallion or broodmare to stamp desirable characteristics upon their offspring with a high degree of predictability) is the result of the parent being homozygous for important desirable traits. As mentioned previously, inbreeding exposes certain weaknesses within the inbred herd. Uncovering these undesirable traits can be an important tool for the overall improvement within a large breeding program. By setting certain selection guidelines, and by carefully eliminating inbred individuals which show inherit weaknesses, the breeder can slowly remove any undesirable recessive genes from their herd. They will find that vigor and fertility are actually improved when inbreeding is accompanied by careful selection.A successful inbreeding program requires good foundation stock and severe culling over many years. For this reason, inbreeding is usually practiced by experienced breeders who operate large farms for the production of superior prepotent breeding stock. It can also be used to establish breeds, or true-breeding types, with respect to certain characteristics such as color or size. A breeding system which uses extreme inbreeding, such as mating between siblings or between parents and offspring, is referred to as CLOSEBREEDING. The detrimental effects of inbreeding (such as decrease in vigor, fertility, athletic ability and size) are usually exaggerated in a closebreeding system. This is especially true when average breeding stock are used and little culling has been implemented. Closebreeding can produce extremely good, or extremely poor, results. Success and failure depend on factors such as planninig, foundation stock, emphasis on culling, and completeness of pedigree and performance records, etc. Haphazard closebreeding could be very detrimental to the overall quality of the resulting offspring. To avoid disaster, a careful study of the merits and weaknesses of the breeding stock should precede a closebreeding program. Only the most outstanding mares and stallions can be used with any degree of safety in a long term closebreeding program. After a stallion proves that he is of superior gene type, the experienced breeder may choose to continue the closebreeding to increase prepotency of future breeding stock. LINEBREEDING, the most conservative form of inbreeding, is usually associated with slower improvement and limited risk of producing undesirable individuals. It can involve matings between closely or distantly related horses, but it does not emphasize continuous sire-daughter, dam-son, or brother-sister matings. The main purpose of linebreeding is to transmit a large percentage of one outstanding ancestor’s genes from generation to generation without causing an increase in the frequency of undesirable traits often associated with inbreeding. Because linebreeding is not based strictly on mating closely related individuals (with very similar gene types), it does not necessarily cause a rapid increase in homozygous gene pairs. Consequently, it will not expose undesirable recessive genes as extensively as closebreeding. For this reason, linebreeding is generally a safer inbreeding program for most breeders.Intensive inbreeding (and resulting increased homozygosity) is often directly related to an increase in the expression of many undesirable traits. Therefore, the linebreeder should carefully study pedigrees for each prospective mating and determine if, and how closely, the mare and stallion are related. By following certain guidelines, the breeder can limit inbreeding (and, therefore, homozygosity) within their herd. At the same time, they may increase the influence of a common ancestor upon the entire strain or family. CROSSBREEDING is the mating of horses from different breeds. Crossbreeding may also be used to produce heterosis, the sudden increase in vigor and fertility caused by a sudden increase in heterozygosity. Because horses from separate breeds usually carry very different genotypes, crossbreeding causes a more extreme form of heterosis. The possibility of each parent contributing identical alleles to their offspring is remote. Heterosis from crossbreeding often appears as a sudden improvement in physical characteristics, such as size, endurance, disease resistance, etc.